A brief autobiography so you&apos;ll have an idea who you&apos;re reading about. But perhaps before I go into what happened next, you'd want to know a little something about me before then. After all, I'm going to be revealing some pretty wild stuff; you're entitled to know how crazy a person I am even without aliens. This lifetime began, for me, on April 8, 1951, at 7:05 pm in Mountainside Hospital in Glen Ridge, New Jersey. 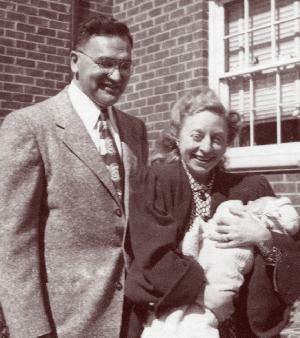 My mother, Edna Mae Brown Cilwa, and my father, Walter Sigimund Cilwa, lived at the time in a small but airy apartment in a complex called Styertowne, in Clifton, NJ. I was named after my grandfather (Vernon Paul Brown) and my father, although under the heavy sedation then used in childbirth, my mother wasn't quite able to spell my father's middle name correctly. So my middle name wound up not really being from anyone in particular, other than the well-known father of modern psychotherapy. 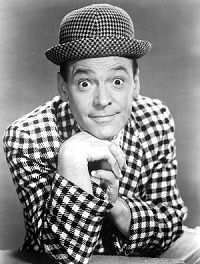 Pinky Lee, 1950s TV personality. One morning, when I was about one and had just started walking, my mom stepped outside for the newspaper and the wind blew the door shut—and locked—behind her. She began banging on the door, calling me to open it. Since I couldn't reach the doorknob, there wasn't much chance of this happening. She finally had to run to the office to get a duplicate key (in her nightgown, which totally humiliated her). 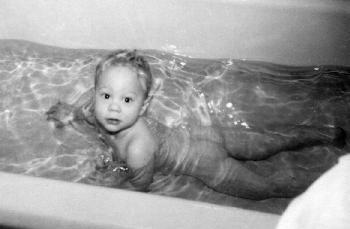 Me in the bathtub, early 1952. Another time, after midnight, a fire alarm woke up the family and I was carried outside, wrapped in blankets. The apartment above us had caught fire. The building was saved, but water damage from the hoses soaked into our apartment and destroyed many of our things, particularly a valued bedspread. I remember looking at the apartment at night, surrounded by people in pajamas and coats and blankets, but do not recall seeing any flames. We eventually spent the rest of the night in a friend's apartment. On June 18th, 1952 (my mother's birthday), my sister Mary Joan was born, and Mom and Dad began thinking about moving into a larger place. In any case, I eventually got over my snit. With the birth of my new baby sister, our apartment was rapidly getting too small. Plus, it still smelled of smoke from the neighbors' fire. We really needed a larger place. As it happened, my father owned a larger place: it was a factory, the Cilwa Mold and Tool Company. 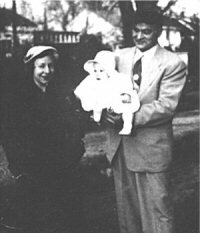 Apparently, business wasn't going so well; after the Second World War, Dad had gone to work for Bendix Corporation, and we moved into the factory building, on which Dad had done a lot of work, some by himself, some with my half-brother, Billy, helping. The place had even needed a new roof, and Mama helped with that. I don't remember moving, but I certainly remember the place we moved to. It was located at 148 MacArthur Drive, and the front part of the building was refurbished and made into a nice little home. My father may have had trouble finishing things, though; my room was given a first coat of paint, but the tape between the sheets of sheet rock was put over that and a concealing second coat was never applied as long as we lived there. In October of 1953, I became big brother to another sister, Louise. Sometime after that, something happened that I remember, though out of context. That is, it happened, and I remember it too clearly to be a dream; but I have no lead-in memory and no lead-out memory. I was in some kind of white place, about the size of a crib. Although the walls were solid, they were not rectangular; and somehow, I could see though them…and what I saw was our car, a Studebaker, from above…and I could see through the roof. I could see my father driving, my mother in the front seat, and Mary Joan and Louise sleeping in the back. I started crying, because I thought they were leaving me; and I began yelling for them, but they couldn't hear me. I might be tempted to call it an early out-of-body experience, except, then, where was I? My sleeping body should have been in the back seat, with my sisters'. I have no answers; I only know that I can remember the experience now with more clarity than I can muster for this morning's breakfast. One block from our house was our church, that of Our Lady of Mt. Virgin. My father did not attend church, but mother did, and I went with her. (My sisters were considered too young to behave themselves.) While there, Mom would give me her Rosary, and I would pretend the little beads were Roman solders, and would pile them up on the helpless Jesus bound to the little cross. Or, sometimes, I would point to an architectural feature and ask about it. That's why I pointed to a particular statue, one Sunday, and asked what it was. "That's the Blessed Virgin," my mother explained. Now, understand, neither the word "blessed" nor the word "virgin" was in my vocabulary; so, I thought the statue was "The Blessed Virgin", not just a representation thereof. My confusion was to become compounded shortly afterwards. It was weeks later, and I had been put to bed on a normal, uneventful, night. However, I awoke in terror to find my room lit by a strange, blue light that glowed from the living room visible through my open door. Between the door and my bed, clearly silhouetted in the doorway, was a tall, angular figure, hooded and gray. To me, it looked like a statue; so I thought the Blessed Virgin was in my bedroom…and it did not belong there. I was terrified, and tried to scream for Mom—only to discover I was also paralyzed. Unable to do anything else, I shut my eyes tightly and waited…and went to sleep. When I awoke, suddenly, sometime later, the figure and light were gone, and so was the paralysis. I did scream, then, and it seemed like it took an awful lot of screaming before anyone came to help me. It was my mother, groggy, who wanted to know what was the matter. "The Blessed Virgin was in my room!" I sobbed, "and I couldn't move!" Mama, of course, like most Roman Catholics, believed in miracles as long as they happened to other people; so she offered her stock response: "It was just a dream, dear. Go back to sleep." For years, I harbored resentment: that she had taken so long to respond, that she hadn't believed me, that she hadn't comforted me. I thought the blue light had been the TV set, so I didn't see how she could have gotten that deeply asleep. 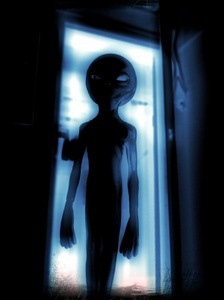 Now, of course, that I am more familiar with the alien abduction phenomenon, I understand that Mom did all she could do under the circumstances. 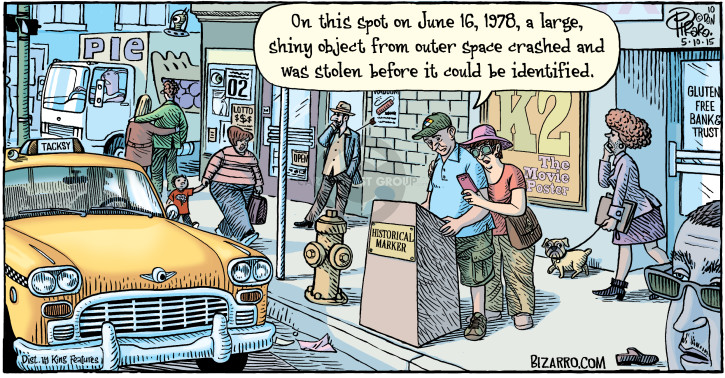 Incidentally, NICAP (the National Investigations Committee on Aerial Phenomena) reported 3 UFO sightings over New Jersey in 1953, including a particularly puzzling one that involved the mysterious disappearance of a F-94C jet fighter-interceptor while chasing a UFO; the pilot bailed out but the jet and its radar operator were never found. Of course, it was over New Jersey…! I remember little of kindergarten except that two nuns taught us. And I remember Flora, who didn't do well in class but who had one skill we all admired: During recess, she would climb to the top of the chain link fence, where she would perch while peeing in her pants. By the end of the year there was a vertical yellow streak staining the chain link. Mom walked me to school the first day. After that, I walked with other kids in the neighborhood going to the same school, which was only a couple blocks from the house. This was the first time I was allowed (indeed, required) to cross a street on my own. There were no crossing guards in those days, of course. But the bigger kids always watched out for the younger ones.